The DQ Sonar Towel Radiator is an amazing chic design. This striking two tone radiator has round bars with a lovely curved side which wraps around centre panel. The DQ Sonar would look be a centre piece in any room from bathroom, kitchen or hall. 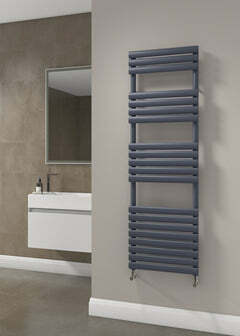 The Towel Radiator comes in Central Heating, Electric and Dual Fuel. For the Thermostatic Electric and Dual Fuel please call us for the price. White/Copper, Chrome, Black or choose from a number of RAL colours. Delivery in 2-3 working days for the 780 x 500mm, 1200 x 500mm & 1620 x 500mm in White/Copper. All others are 4 week delivery. The Radox Aztec Towel Radiator is a hand crafted picture frame radiator that gives you plenty of room to hang your bath sheets. It creates a beautiful mosaic look to your own room. The Radox Aztec Towel Radiator comes in 2 incredible material options, Stainless Steel or Mild Steel Chrome. 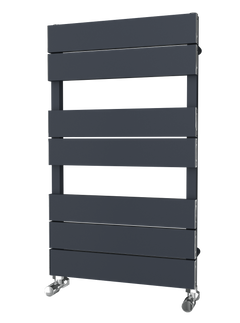 The Radox Lacuna Towel Radiator is perfect for drying multiple towels in your bathroom. With a simple design and gorgeous stainless Steel it's a great buy that comes with a 25 year Guarantee. The Radox Lacuna Towel Radiator is made out of stainless steel. There are 3 fuel options, Central Heating, Electric and eco Dual Fuel. The DQ Altona Towel Radiator is a classic design with the lovely twist of a beautiful rounded look. The DQ Altona really does stand out as an exceptional towel radiator, those towels really will be toasty and warm when you get them off. The DQ Altona is available in chrome or white or RAL finishes. Delivery in 1-2 working days except RAL Colour, which takes up to 2 weeks. The Reina Pavia Designer Towel Radiator is a stylish bathroom radiator, with polished straight rails, simple and elegant. The Pavia is finished in stunning chrome. After decades of simply being a practical room, bathrooms have evolved to have a greater importance in our lives and are now considered as a place of refuge where you can soak away all your worries in comfort, as well as being a practical room. Think of that invigorating long, hot soak in the morning or unwinding at length in a warm bath- there is that one word “warm!” Doesn’t that feel like a soulful experience whilst pondering on life? Now picture all the activities that take place in your bathroom, but imagine it being cold. Even a hot, comforting bath can be ruined by an unforgiving Arctic chill when it’s time to dry off. Radiators, of course, are the best solutions to a chilly bathroom. But, if you’re tight on space or want to keep the room as well as your towels warm, a Towel Rail Radiator could be the answer to your problems. Imagine stepping out of the bath or shower and wrapping up in a warm, fluffy towel- wouldn’t that be the most comforting feeling? Along with this, towel rails can also operate as a cost-effective heater has helped it gain popularity in the UK. There is a wide range of towel rails available, which not only keep your towels cosy, but also act as a design statement. The variety in choice simply means you’re more likely to find the perfect heating solution, though the number of available options may seem a bit overwhelming. If you’re looking for some of the best handpicked towel radiators, then you’ve landed in the right place. At Great Rads, our radiators provide you with towel warming perfection alongside the usual bathroom heating virtues that you’re most likely to find in a standard radiator. At Great Rads, we have pulled together an unrivalled range of towel rail radiators, so you’re bound to find the one that best suits your home décor, no matter which style you prefer it to be in. Our variety of radiator sizes and finishes are especially designed to cater to your needs, which is one of the biggest reasons why we at Great Rads are considered to be the best supplier in our niche. In addition to this, our radiators can be a perfect fit in almost any bathroom setting whilst creating both alluring design and practicality. Also known as heated radiators, modern towel radiators are perhaps one the most overlooked, yet universally used household items, particularly in bathrooms. While you might take them for granted, they’re exclusively designed to keep your towels warm and cosy. As it might be scorching hot now you won’t be thinking about it, but imagine stepping out of your cold bathroom during winter. Most families purchase a towel rail for their bathroom because it’s easy to install and they don’t have to endure a high-priced and taxing process of installing bulky radiators. As the name suggests, these radiators combine contemporary heating technology along with traditional styles associated with previous eras. Traditional towel radiators are appropriate for period properties where it’s trying to maintain the home decor. These are available in numerous styles, but the majority of them are huge and come with larger joints and a slight ladder rail feel. At Great Rads, we think of our designer towel rails as a product that is ‘slightly different’ from the others; that is not a standard ladder rail, or a traditional one, but a combination of the bets elements of each. The designer range includes more bespoke designs; a design that is modern, dazzling and at times plain crazy. These towel rails are available in various sizes and moreover, they’re purchased as means of creating a startling centrepiece. The electric option is the best solution if you aren’t willing to extend the existing heating system or want to avoid moving pipe-work. An electric model can work with the already existing electric systems and are double insulated for safety purposes. These come pre-filled with water treatment in order to prevent corrosion and lime-scale. Just like any other towel rail, these are mounted onto your bathroom wall, but they have to be installed by a professional. Similar to a traditional models, a towel rail comprises of an insert in the middle of its body in order to give extra heat output and provide an extra function as well. These towel rails are best used in a period house, though contemporary alternatives won’t look out of place in a modern house. As mentioned earlier, the options are nearly endless. Depending upon the available space and your personal taste you can opt for any of the above styles. Also, if you’re looking for something sleek and modern, then we’d suggest you to go for a chrome finish. On the other hand, if classic chic is your preferred style, then it’d be better to go for something more traditional. At the end, the choice is completely yours. But, at Great Rads we assure you that you’ll find some of the finest designs that not only suits your taste, but also makes your bathroom look stunning. They are available in various designs, such as stainless steel, compact models and designer styles. Towel rails reduce mildew by drying your towels more quickly, thereby keeping them fresher for longer. Acting as a supplementary heater in the bathroom, they provide soft, ambient warmth which decreases mould-inducing dampness. Heated radiators can be used to gently dry delicate clothing. These are the advantages that make towel rails the latest “must-haves” with other designer accessories, as they have so much to offer to your bathroom. Great Rads provides you with heaps of choices, so that you can go for anything from a small towel radiator to an electric towel rail to keep your bathroom, as well as towels, warm and cosy. Be it a small or large bathroom, our team at Great Rads will be at your disposal to provide you with some of the best, hand-picked towel rails in the market. We will also go the extra mile to ensure that you receive the best possible experience. Towel rails are the ideal option, especially for chilly winter mornings. Our towel rails will not only keep your towel nice and warm, but also make your bathroom look stylish and contemporary. In order to help you find the best radiator for your space, we have compiled all the advice you’ll require to make the right decision. Are towel rails the only source of heat in your bathroom? If that’s the case, you’ll probably require a radiator, which is powerful enough to warm your space as well as the towels. You can calculate the power output of your towel rail with the help of our BTU Calculator. 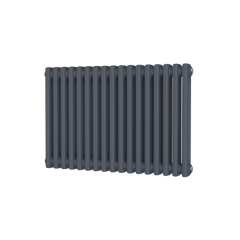 Along with the output of your radiator, its size must also be taken into consideration. This is entirely because the power output required to heat up the whole bathroom varies depending upon factors like size of the room, as well as the level of existing insulation. So, are you willing to have warm, comfy towels during summers as well as winters? Then you need an electric model since it will work with your existing electric systems. Always check the available wall space for your towel rail. For instance, a full-sized radiator capable of heating larger bathrooms is likely to take up the entire wall, thus ensure you don’t require that space for any other stuff. On the other hand, a small towel radiator can be mounted on the wall, which in turn leaves space below for storage purposes. How many towels do you hang up on a daily basis? Your heated towel rail in an en-suite wouldn’t require much hanging space when compared to a family bathroom. Therefore, make sure you’ve got enough space between each rail so that you can drape large bath sheets. Perhaps the most common radiator for a bathroom is the stainless steel radiator. Not only because it’s the most efficient and resilient choice, but it’s also suitable for contemporary bathrooms. These can also be made from soft steel, chrome or brass, whereas some of them have copper and nickel elements. 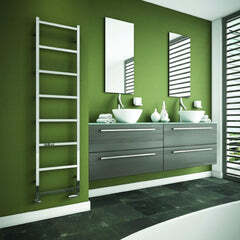 The trendy towel rails are the white and chrome designs, as they complement both traditional and modern bathroom suite. Nevertheless, these are also widely available in black, copper or grey to suit any bathroom. There’s a massive selection of eye-catching styles and designs out there. So, if you’re looking for something that can be used as a feature or focal point, be bold and go for a curved design. However, if you have a small bathroom and want your rail to blend in, then you can opt for white radiators against white tiles. For small to medium sized bathrooms, it is completely possible to maintain the comfort level using a single towel rail. But, to truly benefit from the heat, it may be worth investing in additional heated towel rails, specifically for larger spaces. This means that towels can be warmed and at the same time they won’t cover the entire radiator, whilst absorbing most of the heat. This is also an ideal option if you’re planning to store 2 to 3 towels at once. In several ways, towel rails can help turn your bathroom into a healthier environment. Damp towels are an ideal breeding ground for harmful bacteria, but by hanging your wet towels on the radiator, you will help them to dry out rapidly. Most of our radiators require a pair of valves to work. A timer or thermostat means the towel rails will automatically turn on and off at a particular time of the day. That way, you can reduce the running costs without having to compromise on warmth whenever required. You can take a look at our radiator valves page to find out more about them and other fittings that are required for installing radiators. Choosing an electric towel rail means that you can use it separately to have warm towels even in those months when central heating is not on. Moreover, electric radiators are very energy efficient. When the heated towel rail with right BTU is combined with a thermostat that switches heat on only when necessary, it can turn out to be a highly cost-effective choice for your bathroom. The installation of your radiator completely depends on the shape and size of the space, as well as the power of the towel rail. In most of the cases, the ideal place to install a towel rail radiator is on the coldest wall of your bathroom- typically the external wall with a window. When the radiator is being installed, you’ll have to adhere to UK wiring regulations that divides your bathroom into separate Ingress Protection (IP) zones for your safety. Your electrician will be the best person to advise you on the right areas to place your radiator so that they are in line with wiring rules in the UK. If you want to fit the heated towel rail in your family bathroom, then it may be better to mount it further up the wall and set it at a lower temperature so that you can prevent it from posing any kind of threat to the inquisitive little ones in your house. Towel rail radiators from Great Rads would be an ideal addition to your bathroom, as they can maintain a comforting temperature in the space and also offer you with warm, fluffy dry towels after an invigorating shower or bath. What’s your preference and estimated radiator budget? This is a vital question that you need to ask yourself, once all other factors are taken into consideration. Style doesn’t need to be expensive and our range has designs to suit any budget. No matter what your price range, ultimately, it all comes down to your style and design requirements and more importantly your budget constraints. You can either go for a curved radiator with a small budget, or bring more luxury in your room with elegant, yet slightly expensive radiators. At Great Rads, we have looked far and wide to provide our customers with the finest towel rails available. Almost the entire range of Great Rads radiators are delivered straight to your door, with free UK delivery. You can take a look at the relevant delivery information of our radiators on the respective product pages. We do try to be as precise as possible and also go that extra mile to ensure our products are delivered within 2 to 3 working days. At times, however, there may be some delay- particularly if the product is in production. Also, if you’ve ordered a non-stocked item, it could take 4 to 6 weeks to manufacture. Our team will let you know the approximate delivery time whilst you’ll be making an order. For further details about product delivery, you can visit our deliveries page. Great Rads is a fast-growing radiator dealer based in the UK. We offer our customers with some of the best products along with the kind of dedicated and personal services we would like to receive ourselves. We offer you an unrivalled range of handpicked radiator designs to suit any style, room or budget. We are really proud of our suppliers who are our partners. Having gained years of hands on experience and local knowledge in the business, industry and design, we at Great Rads have secured an enthralling range of radiators with a diverse price range. Get in touch with us to see what we’ve got for your bathroom needs. For further enquiries regarding our radiators, feel free to call us on 01803 450330 or simply drop in an email on sales@greatrads.co.uk. Our team will be more than happy to help you!